Wubba lubba dub dub! At long last, Adult Swim has finally, after nearly two years, released a brand new episode of Rick and Morty. In what appeared to be a cruel April Fool's Day joke, the network announced that they were streaming a brand new episode of Rick and Morty on their website and on the air in a loop. Indeed, it turned out to be genuine and the first episode of Rick and Morty season 3 is out in the world. Plus, they finally gave a semi-firm confirmation about when the rest of season 3 will air. 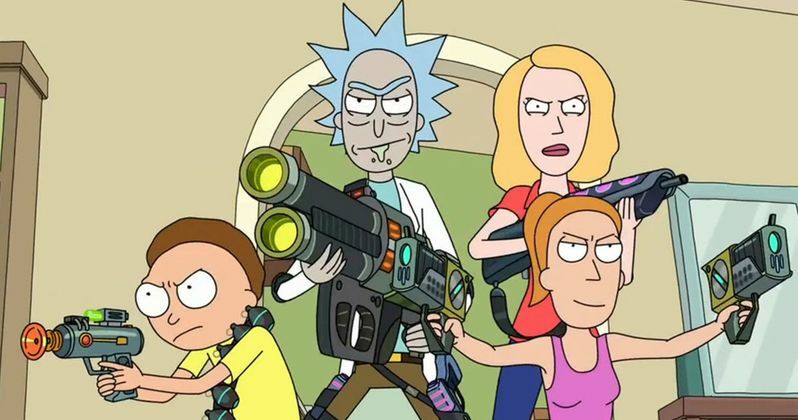 In a promo that aired during last night's Rick and Morty season 3 premiere marathon, it was revealed that the new season will debut on Adult Swim this summer. That is a bit vague, but at least fans now know that new episodes are coming. And, if you were lucky enough to catch it last night, there is at least one new episode out. Assuming you missed the premiere marathon, there are still a couple of ways you can catch the Rick and Morty season 3 premiere. At the moment, the Adult Swim website is airing an entire Rick and Morty series marathon that will be punctuated with the new episode. So, if you missed it last night, head on over to AdultSwim.com and relive some of your favorite moments before getting to see the new episode. Also, quite a few folks decided to upload the episode various places online, since it was playing on a constant loop for several hours. This is something that the folks at Adult Swim seemed to understand might happen, as evidenced by this tweet that was put out during the marathon. "This better not end up on the internet. We're on the honor system, people. Would you steal a car?" We won't spoil anything, just in case you didn't see the episode yet, but it is hard to imagine fans will be anything but happy. Not just because this is the first new episode of Rick and Morty since 2015, but because it was a damn good episode. A lot of questions were answered, what may go down as one of the best jokes in the history of the series occurred and, as usual, it was brilliant. Yes, there are laughs to be had, but it is also pretty dark. Not that Rick and Morty is a stranger to dark moments, but this episode probably takes the cake. But the episode definitely seemed to be worth the wait. Now we just have to wait a couple more months for the rest of season 3. There are few shows that could actually benefit from taking a nearly two-year hiatus, but Rick and Morty fans have been absolutely starved for new episodes, and Adult Swim has capitalized on that in a big way. Dan Harmon and Justin Roiland have been working hard on this new season and it will finally be paying off soon. Rick and Morty season 3 is set to air this summer and you can catch the Rick and Morty season 3 premiere right now online. Be sure to watch it while you can. This better not end up on the internet. We're on the honor system, people. Would you steal a car?